Everyone who’s ever been on a race track is familiar with the waiver you sign releasing certain legal rights in case something serious goes wrong. Yet that waiver wasn’t enough to keep motorcycle track day organizers Keigwin’s At The Track from being sued for a crash at one of their Laguna Seca events, and it has racing and track day event organizers everywhere a bit worried. 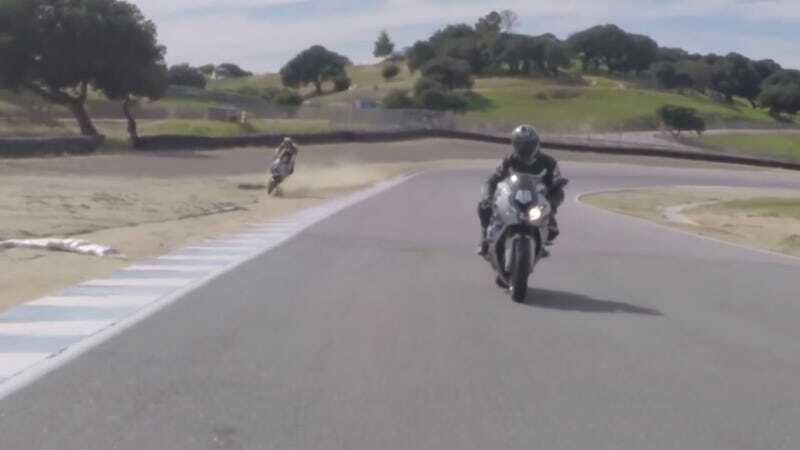 Daniel Kim broke both of his legs at the Keigwin’s At The Track March 2015 event after his 2013 Ducati Panigale 1199 ran off track at turn five on Laguna Seca and hit a sandbag, according to bike site RevZilla. The sandbag tossed Kim over his handlebars, injuring him. Kim’s lawsuit alleges that Keigwin’s At The Track was grossly negligent in leaving these sandbags in place. Laguna Seca adds these sandbags off-track to direct water when it rains, according to Laguna Seca’s lawyer Andrew Swartz, who was cited as a source by RevZilla. Laguna Seca’s elevation changes are both a blessing and a curse—the very elements that make the track fun also can make tricky puddles on the track surface when it rains, and that preventing erosion due to this runoff is a constant battle. Erosion already appears to have formed a small ditch where the sandbags were in place, which is a hazard in its own right for vehicles that go off-track. ﻿On a personal note, I have difficult news that I wanted to share with the Lit Motors community. Recently, I was involved in a motorcycle track accident. The accident was a high speed (75-80 m.p.h.) collision with a misplaced sandbag as I came off the track. Though I broke both my legs, very thankfully, I did not suffer any brain or spinal damage. We all know motorcycles are dangerous and not for everyone. In retrospect, if I had been driving a C-1 in that collision I would have been safer and likely incurred far fewer injuries. This event has further galvanized my dedication to bringing the C-1 to market. Creating a safer ride for millions of people and making dangerous two-wheeled vehicles with no gyroscopes a thing of the past. I have decided not to return to the track unless it is with an AEV C-1 platform with similar performance and greatly increased safety. In the newsletter, Kim describes the sandbag as “misplaced” and notes that he won’t go back on track unless it’s with his company’s C-1. The implications of Kim’s lawsuit, which is scheduled to come to trial soon, extend quite a bit further than [Keigwin’s At The Track]. His lawsuit could raise insurance costs for track day operators and amateur racing organizations. It may already have discouraged some specialty insurance companies from covering track days at all. Track events—along with the venues that host them—need insurance to protect them from a number of things that could go wrong, including injuries and death from activities which the participants acknowledge (remember that waiver?) as dangerous. Sometimes this is enough to cover any claims brought against them, but in the case of this Laguna Seca track day, it hasn’t been enough. Kim’s lawyer initially sent a letter to Keigwin’s At The Track demanding $15 million over the incident, according to RevZilla. This was immediately rejected as it was over the $5 million in coverage Keigwin’s has through its insurance company. Kim’s lawyers then asked for half the original $15 million amount, which was still more than the insurer could pay. A clause in the contract Keigwin’s At The Track signed with Laguna Seca notes that the renter of the facility has the right to examine the track before using it, RevZilla explains. While Laguna Seca’s placement of the sandbag in the first place was not ruled to be grossly negligent, Keigwin’s may still be found at fault for not inspecting the track beforehand and opting to either move the sandbag, or note it as a hazard in the riders’ meeting before the event. Complicating matters further is the fact that Kim missed the riders’ meeting that morning, as noted by Keigwin’s At The Track owner Szymon Dziadzia in a text exchange with RevZilla. Kim was allowed to ride anyway, and the crash happened about 10 laps into his afternoon session. Lawsuits like this are bad news for event organizers everywhere—not just the named party getting sued. Insurance companies often charge more if they believe they’ll have to pay out on claims. It’s the same reason your car insurance drops in price after your teenage years: your insurance company doesn’t think you’ll crash as often. When insurance for events goes up, it’s harder for the groups and tracks hosting those events to break even. That cost may be passed along to you as a participant, or it could convince certain operators to close down entirely if it’s no longer worth it for them to host track events. Thus, the mere fact that Kim’s claim is getting heard in court at all could potentially have negative consequences for other events, as there are court costs involved. Many such suits are settled out of court—which Dziadzia doesn’t want to do—but again, settlement costs someone involved money. Usually it’s the insurance companies, and that’s used as justification to raise premiums across the industry. Dziadzia says he wants to fight this lawsuit on principle, as he is worried that Kim’s lawsuit would set a precedent which would result in further legal action against other track day operators. The mere costs of fighting a major lawsuit can sometimes bleed a smaller company dry and force it to close before it has exhausted every avenue of its legal defense, so Dziadzia’s worries aren’t without merit even if the courts determine his company is in the right. The March 2015 event was the first one for new Keigwin’s At The Track owner Szymon Dziadzia after purchasing the track day group from original owner Lance Keigwin, RevZilla notes. Keigwin had operated the group for 16 years without a single lawsuit, making Kim’s the first. RevZilla’s full story here is worth the read. Having known a number of track management personnel and event organizers over the years, I’ll back up their conclusion that legal liability is a constant concern for everyone who puts on the events we love to do. Track events, no matter how many wheels are involved, are dangerous, and we’re all warned beforehand that on-track incidents can result in injury or death. Even if nothing happens at your specific venue or event, making sure you’re covered in case the worst-case scenario happens seems to get more expensive—and worrisome—every year.